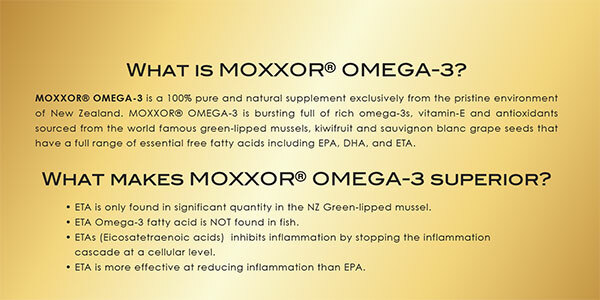 MOXXOR OMEGA-3 is a proprietary all natural whole food supplement that contains the highly concentrated potent Omega-3 oil extracted from the green lip mussels combined with the cold pressed oil from the kiwifruit and sauvignon blanc grape seeds encapsulated in a very small soft gel capsule. The New Zealand green lip mussel contains a unique combination of at least 18 well represented omega-3 structures in both tri-glyceride and phosphor-lipid forms, as well as numerous fatty acids such as myristic acid, palmitic acid, palmitoleic acid, vaccenic acid, nervonic acid, oleic acid along with other vital nutrients like carotenoids and astaxanthin to name just a few. MOXXOR OMEGA-3 contains ALA, SDA, ETE, DPA, TPA, THA DHA, EPA as well as ETA. ETA has only been found in any significant quantity in the New Zealand green lip mussel and is the subject of extensive research for its anti-inflammatory properties. The ETA from green lip mussels has been proven to be more effective for reducing inflammation than other sources of omega-3. The omega-3 within MOXXOR OMEGA-3 has a full spectrum of all known omega-3’s in bioavailable forms, plus other vital polyunsaturated fatty acids. Omega-3 fatty acids contain vital nutrients for human as well as for animal health and are essential for the health of each and every cell in the body. The cold pressed kiwi seed oil provide a full spectrum of all 8 natural vitamin E, and Oleic Acid, Folate, Vitamin K, and the cold pressed sauvignon grape seed oil provide antioxidants including lutein, zeaxanthin, astaxanthin, carotenoids. MOXXOR OMEGA-3 synergistic formula of 3 pure natural super foods from New Zealand delivers a powerful combination of omega-3, vitamin E and antioxidant all in one tiny capsule. All purchases come with a 90 day money back guarantee. The typical modern diet is very low in omega-3, and a deficiency of omega-3 affects the organs and immune systems of the body at a very fundamental level. Omega-3 acts as powerful therapeutic agent for reducing inflammation and to provide overall wellbeing. The typical modern diet is very low in omega-3’s, while being extremely high in omega-6’s (all plant oils), thus creating an imbalance of these important nutrients. This imbalance is known to affect the inflammatory responses of the body, which in turn leads to many chronic disease conditions. A deficiency of Omega-3 affects the organs and systems of the body at a fundamental level—and can manifest in a wide variety of ways. When this imbalance is present (as is the case for most of us), omega-3’s function as powerful therapeutic agents. 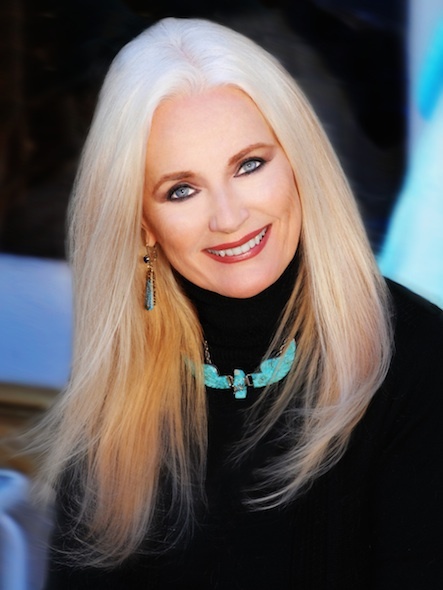 By helping to maintain a state of well-being, they are one of most important preventative nutrients we can consume. 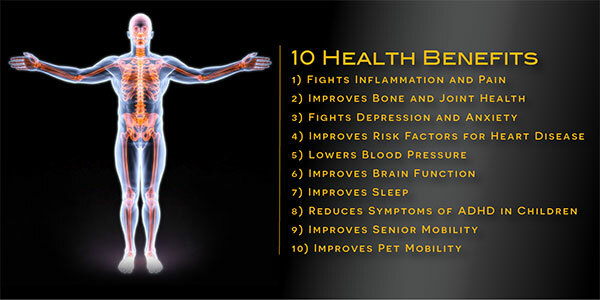 MOXXOR OMEGA-3 is 100% NATURAL | GMO free | Toxin free | Preservative free | Gluten free | Mercury free | Chemical free. Omega-3’s exist in many forms. MOXXOR OMEGA-3, being a natural oil from the New Zealand greenlip mussel, contains ALL known omega-3’s including ETA, not simply one or two, like most products. This whole food form makes MOXXOR Omega-3 far more potent and bioactive, even when taken in smaller doses. The addition of a complete-spectrum of vitamin E from the kiwifruit seed oil, and the natural oil from the Sauvignon Blanc grape seed, complement the omega-3’s in a very powerful way. These nutritional powerhouse plants provide all eight natural forms of vitamin E (all 4 tocopherols and all 4 tocotrienals), and an extremely potent spectrum of free-radical scavenging antioxidants (including OPC’s, folate, lutein, zeaxanthin and astaxanthin). MOXXOR OMEGA-3 formula is therefore totally unique and extremely potent. These components are in a whole and unadulterated form that the body recognizes and easily assimilates. All of this complex, whole-food synergy is found in one small MOXXOR OMEGA-3 capsule. FDA Disclosure: The statements made on our websites have not been evaluated by the FDA (U.S. Food & Drug Administration). This product is not intended to diagnose, cure or prevent any disease. The information provided by this website or this company is not a substitute for consultation with your health care professional and should not be construed as individual medical advice. If there is a change in your medical condition, please stop using our product immediately and consult your healthcare professional. Do not use if safety seal is broken or missing.